What field was your house built on? and is an ongoing project to last several years. OK, so not necessarily fields as some are parcels of land containing dwellings. The Yeovil Tithe Map of 1842 shows over 1,300 parcels and the Yeovil Tithe Apportionment of 1846 lists and describes 944 of them. The Preston Plucknett Tithe Map of 1849 shows 194 parcels and the Preston Plucknett Tithe Apportionment of 1848 lists and describes all 194. Note 1: Throughout the Fields Minor Theme the field area abbreviations used in the Tithe Apportionments such as 4a 1r 15p - for an explanation of land measurements click here. Note 2: The highlighted parcel names below have their own pages and clicking the highlighted name will jump to that parcel's page, be it a field, building, etc. Similarly owners and occupiers of fields listed in the Tithe Apportionments also have hyperlinks leading to their individual pages. It is hoped that, in time, all parcels, be they fields or buildings, will have individual pages fully integrated with owners' pages and occupiers' pages throughout this website. For details on historic land measurement (ie acres, roods and perches) click here. I've arbitrarily split Yeovil into several different areas simply to allow me to create maps of a suitable size to fit the individual web pages. Below left are listed the above areas with their respective fields while below right is an alphabetical list of all of Yeovil's fields. This area is bounded to the north and east by Chilthorne Domer, Limington and Mudford and to the south by Yeovil Marsh village. This area is bounded by on the north by an old lane (now a track), to the west by the en-named lane between Vagg and Larkhill, to the south by Tintinhull Road and to the east by Coppitts Hill Lane. This area is bounded by Tintinhull Road and Coppitts Hill Lane to the north, Ilchester Road to the east, Thorne Lane to the south and the un-named road between Vagg and Larkhill to the west. This area is bounded by Combe Street Lane to the south, the old Ilchester Road to the west and the detached part of the Parish of Preston Plucknett, known as Preston in Stone to the east. This area is actually a detached part of the Parish of Preston Plucknett, known as Preston in Stone. This area is bounded by Thorne Lane (north), Larkhill (east), Preston Road (south) and the Borough boundary (west). This area is bounded by Larkhill Road (west), Thorne Lane (north), Ilchester Road (east) and Stiby Road (south). This area is bounded by Larkhill Road (west), Stiby Road (north), Ilchester Road (east) and Preston Road (south). This triangular area is bounded by Ilchester Road (east), Combe Street Lane (north) and Mudford Road (east). This area is bounded by Mudford Road (west and north), St Michaels Avenue (east) and Milford Road (south). This area is bounded by Borough boundary (north), River Yeo (east) and the former course of Lyde Brook to the south and west. This area is bounded by Sherborne Road (southwest), Lyde Road (northwest), Vale Road and Lyde Lane (northeast) and the River Yeo (southeast). This area, essentially the whole of the old Preston Lower Farm, is bounded by Preston Road (north), Watercombe Lane (west), Dodham Brook (south) and Dodham Tributary (east). This area is bounded on the north by Preston Road, the east by Kingston and Princes Street, to the southeast by Hendford, the southwest by Horsey Lane and Beer Street and in the northeast by Preston Plucknett. This area is bounded by today's Sherborne Road (north and east), Newton Road (west) and the River Yeo (south). This area is bounded by West Coker Road (south) and Dodham Brook (north) an arbitrary line between the two (east) and the Parish of Brympton (west). This triangular-shaped area is bounded by West Coker Road (north), the Dorchester Road (east) and Turner's Barn Lane and Placket Lane (south). Today this area lies in East Coker parish. It wasn't all that long ago that there were more fields than houses in Yeovil. 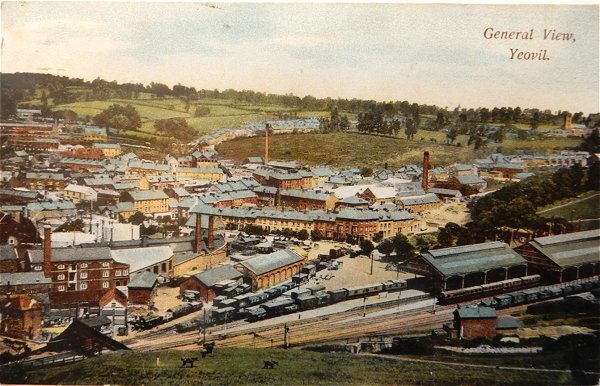 This postcard dates to about 1905 and shows, at centre, the chimney of the Eastland Road brickworks with its associated buildings clustered around its base. To its left is the leather works built by William Bide (recogniseable by the double roof with a row of six black windows). Running along the bottom of the photograph is Station Road with the Alexandra Hotel at bottom right. In the top half of the photo, Eastland Road runs behind the chimney with fields either side!! !